Genuine microbial barrier against infection. Protects against gastrointestinal infections (diarrhoea, colitis). Effective at reducing episodes of constipation. Bifidobacterium was isolated for the first time in 1899 from a healthy, breast-fed new-born baby. It was subsequently accepted as an independent genus of bacteria the main characteristic of which is to produce lactic acid and acetic acid as the principal products of glucose fermentation. Isolated in 1977, the human bifidobacteria strain Bifidobacterium longum BB536, is the most widely-studied in terms of health benefits. It is also one of the best-known. Over 40 articles have been published in scientific journals, highlighting in particular, its role in improving the intestinal environment, helping to maintain a healthy immune system and fight infection, and promoting bone strength. Intestinal microflora comprises over 100 species of beneficial, neutral or harmful bacteria - all in constant conflict with each other. Their number and balance can be upset by a wide variety of causes such as antibiotics or other drugs, stress, ageing or alcohol consumption, in which case the health of the intestine and even the individual in general, can be affected. Probiotics such as bifidobacteria help to restore balance to intestinal microflora. - boosts bone strength, probably by improving calcium absorption. 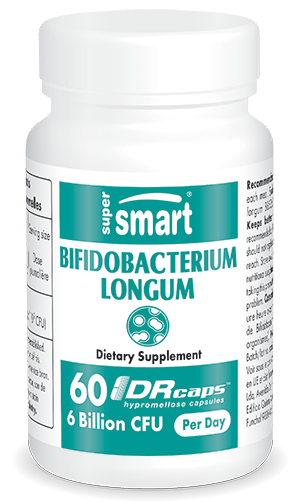 The many benefits of the strain Bifidobacterium longum BB536 can be obtained by taking our supplement which is formulated in DR Caps™ for optimal absorption and bioavailability. Each capsule provides almost 2 billion microorganisms, with the recommended dose of three capsules a day delivering an exceptional 6 billion microorganisms. This dose can be adapted according to your needs and the advice of your therapist. These probiotics should be refrigerated in order to preserve their quality. Their efficacy can be enhanced by also taking prebiotics such as fructo-oligosaccharides which promote probiotic growth. Other ingredients: magnesium stearate, microcrystalline cellulose, maltodextrin, silicon dioxide. Each capsule contains 25 mg of Bifidobacterium longum BB536† (2 billion micro-organisms*). †BB536 is an active probiotic strain developed by Morinaga Milk Industry. *90% stable when stored in the refrigerator. Take one capsule an hour before each meal.